Slab on Grade Foundation Systems gained popularity on a mass scale after World War II. Many returning veterans needed affordable and reliable housing in primarily suburban areas of the United States. To build homes in volume, developers and builders chose shallow bearing concrete foundations systems because they were relatively inexpensive, and could be built in about half the time it took to build basement type foundation systems. Structurally, these primarily residential foundations resemble the geometry of a “waffle”, with “ribs” on the bottom, and a flat smooth surface on top. The ribs stiffen the slab to prevent excessive movement, and the smooth top surface accommodates living area floors. Over the past 50 years, slab on grade design & construction techniques have not changed much. The design principles are essentially the same, and it is arguably one of the most reliable and popular foundation system types on the market today. In Austin Texas, one of the crucial underlying design principles of shallow bearing slab on grade foundation systems is its “single unit” behavior. To do their job, slab-on-grade foundation systems act as single structural elements with uniform stiffness. These foundation systems are designed to respond uniformly to resist upward or downward movement caused by soil pressure from below, and heavy structural loads from above. In doing so, these slab-on-grade foundation systems are stiff enough to buffer potentially damaging soil and subgrade material movement, yet flexible enough to protect the supported structural elements from unsafe or excessive planar tilting. Properly repairing a failed or structurally compromised slab on grade foundation system requires a design method that mirrors its original design principle. Since shallow bearing foundation systems are designed as single units, they likewise must be repaired as a single unit. At a minimum, the remedial structural design must uniformly stabilize the entire foundation so it can resist the soil, dead and live loads imposed upon it. Austin, Texas-Case #1: Repairing Part of the Slab-on-Grade Foundation System-Partial Piering. Stabilizing only part of the system restrains and limits its movement in a localized area, allowing the remaining unrestrained portion of the foundation to continue to freely move. Like moving a lever up and down, the unrestrained part of the slab transfers and focuses its stress to the area between the restrained and movable portion slab. This transferred stress can and often does cause additional damage to the brittle concrete foundation structure, thus repeating the cycle of foundation system structural failure. Austin, Texas Case #2: Repairing the Entire Slab-on-Grade System-Full Piering. 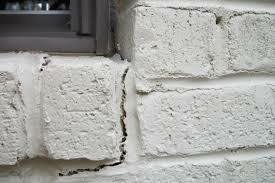 Whether repaired or not, the foundation system is designed to behave as a single structural element. When an engineer designs this type of foundation system, shear, deflection, and strength is evaluated for the entire foundation, not just part of it. So why should an appropriate repair address only part of the slab? The single unit slab-on-grade design principle allows the entire foundation system to react to soil movement uniformly. In doing so, the impact of excessive soil movement to the brittle house materials (brick, sheetrock, etc.) is minimized, thus protecting the slab and house from cosmetic or structural damage. A reliable, durable, and time tested method for uniformly stabilizing (full Piering) slab-on-grade foundation systems includes underpinning, where a slab on grade foundation (interior and exterior grade beams) bears upon and span underpins (drilled and steel reinforced concrete piers, or DRCP’s). For residential foundation systems, these underpins are strategically placed beneath the expanse of the foundation system to depths exceeding eight feet to provide maximum support. Unlike the typical (and inexpensive) multiple segmented concrete pile components stacked atop one another like unstable kinder blocks, DRCP’s are poured in place, reinforced with vertical steel, and placed to bear on deep, yet stable soils, free from seasonal moisture variations. More importantly, and unlike segmented piles, DRCP’s provide superlative resistance to soil friction that tends to push the underpin up (float) or from side to side (lateral). As such, DRCP’s provide a stable bearing surface for the damaged foundation system by limiting its ability to move vertically or horizontally. For a residence of like kind, quality age and size, 30-40 reinforced concrete underpins drilled to a 10-15 foot depth and placed at the interior and perimeter of the foundation system may be expected. So, if your unbiased engineer recommends foundation repair, DRCP’s, while expensive, must be strongly considered as the repair method of choice for slab on grade foundation systems. Other methods, while inexpensive, such as mudjacking, soil stabilization, using pilings, or partial piering may satisfy limited budgets in the near term, they will probably fail and cost you more money in the long run.